The beauty of our solar system is often captured by the countless space probes drifting endlessly through the infinite vacuum of space. The breathtaking picture below was captured by the Juno spacecraft back in December, and gives us an incredible glimpse at the planet Jupiter which orbits between 365 million miles and 601 million miles away from us here on Earth. Enhanced by software engineer Kevin M. Gill, the gaseous planet’s hydrogen and helium atmosphere swirls around like an abstract painting, and makes the white clouds and blue sky of Earth seem almost boring by comparison. The Juno spacecraft snapped this picture about 8400 miles from Jupiter, which was the craft’s tenth closest flyby of the planet to date. Juno has been orbiting Jupiter since July 2016 on a mission to measure the planet’s composition and gravity field and search for clues on how the planet might have formed. After the completion of its mission in about six months, Juno will be intentionally thrust into Jupiter’s atmosphere where it will disintegrate. The fifth planet from our sun is the largest in the Solar System, but as inviting as it may seem from pictures, the gas giant is almost certainly uninhabitable. 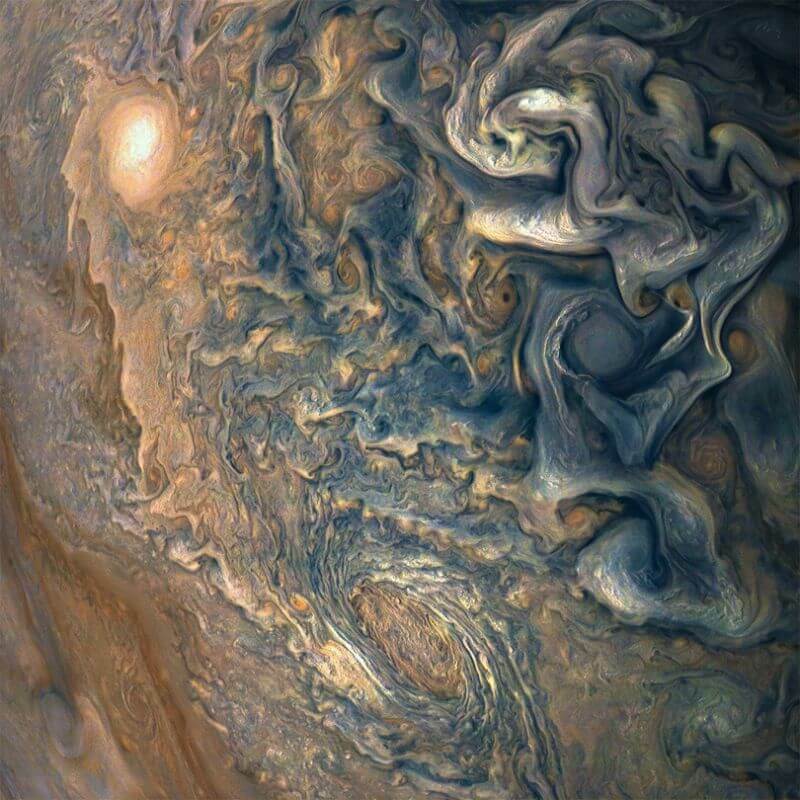 Juno also captured an even more incredible picture of Jupiter’s clouds from about 8292 miles above its atmosphere. This image was color-enhanced by Gerald Eichstädt and Seán Doran who used publicly available data from Juno’s sensors to make it happen. Countless amateur photographers and members of the scientific community use data from telescopes, spacecrafts and other instruments to enhance and colorize images of the objects in our universe. These pictures allow us to get a better sense of the physical makeup of various planets, moons and stars, and can also aid in the search for the possibility of life elsewhere in the universe.